I haven’t done a DIY post in so long! Which is silly as I have been making lots of bits of pieces lately that would be fun to share with you all! My issue has been lack of a lap top, but I have been lent a lap top so I can finally share this pretty wooden letter DIY! Yey! It’s such an easy one and so fun to make! This specific letter was sent as part of my ‘Spring’ themed #DICraftSwap. 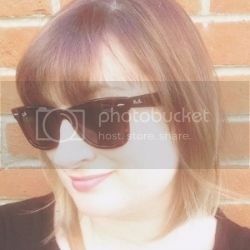 If you’ve not heard of this swap then you need to check it out, it’s run by Hannah over at Dainty and Ivory and is such a fun idea, each month she pairs you up with someone to make and send some goodies too and each month has a different theme. 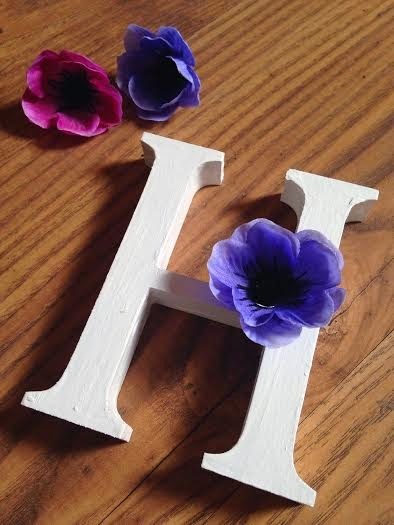 So as you may have gathered I had Hannah to send to for the spring themed swap, hence the letter H! You can find wooden letters in most craft shops now, I actually found mine in a garden centre! So first step is to paint your wooden letter, I used a white gloss paint which I had lying around at home. I wanted a glossy bright finish so this worked perfectly for me. To get good coverage I ended up doing quite a few coats of paint. Once the paint was dry I then chose the type of flower I wanted to decorate my letter with. I have quite a few fake flowers at home as I use them to make the floral crowns I sell, but you can pick these up pretty cheap in shops like wilkos or somewhere similar. I then cut the flower head off of the stem and using a hit glue gun, I put a blob of glue on the area I wanted to stick the flower on. I then held the flower in place until it felt like it was sturdy. I then left it to dry! I’ve made these letters for a few friends now, they are really easy to do yet so effective! What do you think? It is just lovely! What a sweet idea!!! I'm sure she will love it.